Records made by the State Department contain intelligence data about each of the content of stomach contents and even the head of Indonesia 1964-1968, published 2001 in the popularity of Megawati Sukarnoputri became president of Indonesia. 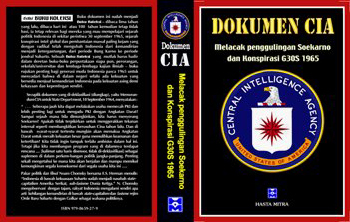 Top security considerations were used to US-Indonesian relations, the publication of documents that most of the CIA's job is canceled launched after circulating some moment in the United States government sites. At the same time in Iraq, U.S. forces conduct large-scale bombing attack to topple Saddam Hussein from the presidential throne. Iraqi diplomats in Jakarta once intrigued by the publication of this book in Indonesian. They certainly think there is a new friend in Jakarta to defend Iraq in an effort to struggle against the United States. What's in the transcripts than a thousand pages thick this so it is considered dangerous US-Indonesian bilateral relations? Report a telegram from the U.S. embassy in Jakarta to State Department dominated the contents of this report is also coupled with the CIA's analysis of the experts into the recommendations for further steps in diplomacy and U.S. intelligence in Indonesia. In addition to the detailed analysis of the countervailing power of the PKI that the Army, so it was decided that the U.S. will provide assistance as possible for the Army to win the struggle for power will fall or when Sukarno was overthrown by a conspiracy of the work together or alone from different intelligence agencies moving in Indonesia, namely the Soviet Union, Britain, Czechoslovakia, China, and the United States. Preparation to establish armed forces and friendly leaning Americans began to be built by giving military aid to educational institutions and sophisticated telecommunications equipment support for the troops who have fostered the CIA from the Army of the Republic of Indonesia. Communist Party of Indonesia as the next major hotbed of President Sukarno, who was obviously being very good at playing the steps stood a balance between forces that are hostile to each other. U.S. government-run strategy is to play the assistance provided to Indonesia is actually intended only when the Indonesian Army has been in the grip of those concerned without realizing it, such as rice and other food assistance. The various characters who will hold the key to power in Indonesia as Suharto, Adam Malik, and so on are also listed in the U.S. State Department report. Openly the United States really want to eliminate communism from Indonesia and also anyone who would defend him. State speech of President Soekarno every August 17 the subject of discussion for the American authorities who are members of the NSC is composed of State Department, CIA, and U.S. President. Detailed reports showing the date the incident was completely expose American role in the overthrow of Sukarno and destroy the Indonesian Communist Party either directly or indirectly. One strategy used by diplomats and intelligence is to support the Army of the Republic of Indonesia.